This is Day 4 out of 5 for Christa's and my mini blog hop featuring products from the Occasions and Sale-A-Bration catalogs. The new Occasions catalog and Sale-A-Bration promotion started January 6th! For every $50 you spend, you can pick one FREE Sale-A-Bration item. Are you having fun getting different ideas for the products in both catalogs? Check out our blogs every day this week for fresh ideas. You'll love Christa's projects featuring the Wood You Be Mine stamp set. Christa's blog is Dusk till Dawn. Be sure to use Google translate to see her posts in English. 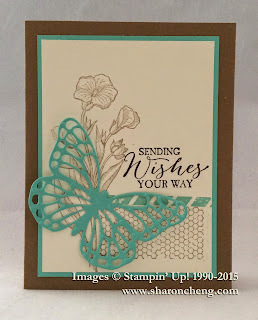 Today, I'm featuring the Butterfly Basics stamp set. Did you know that you can order this stamp set in wood mount, clear mount or photopolymer? You can also order it in a bundle with the Butterfly Thinlits. The clear mount bundle (139323 $51.75) is just over $50 so you can save 15% on the bundle and also pick a free Sale-A-Bration item during our promotion. WooHoo! I'm been wanting a butterfly die, but dreaded the tedious work with such an intricate design. Then one of my Stampin' Up! friends shared a tip for using dryer sheets to make this work easy peasy. I liked the idea so much that I made a quick In-A-Minute video tutorial. It will take only a minute (okay, really less than 2 minutes) to see 2 tips for making die cutting with thinlits a breeze. This picture tutorial has all of the details too. This tip speeds things up so much I plan to use the butterfly die on a swap card. I wouldn't be able to do that without using dryer sheets. Try out the dryer sheet tip and let me know what you think. p.s. I don't use dryer sheets for my regular laundry. Imagine my neighbor's surprise when I asked if she had some dryer sheets I could have. LOL. Needless to say, I've bought my own now and they are in my craft area, not my laundry room. I do recommend you invest in the unscented dryer sheets. Visit my online store to get what you want for your next project. Remember that when you purchase $25 or more in product, you are eligible for my Rewards Program. Love the butterfly and your card too. Tomorrow already our last day. Time flies! I'm in love with this bundle! Lovely card. I just got this butterfly set and can't wait to try your card!